Gloria Martin is credentialed by the State of Texas as a Licensed Marriage and Family Therapist (LMFT) and a Licensed Professional Counselor (LPC). She is approved by the state of Texas as an LPC and LMFT supervisor. Gloria received her Bachelor of Science degree in Family and Child Services from Auburn University in Auburn, Alabama. She has a Master of Arts degree in Marriage and Family Therapy from the University of Houston-Clear Lake in Houston, Texas. Gloria has a private counseling practice and works with individuals, couples, and families. She specializes in work with family systems. Focusing on strengths and a belief that people want to change, Gloria helps families, couples, and individuals discover ways to function optimally. Additionally, she is interested in the connection of mind, body, and spirit and assists in helping people care for their inner self. 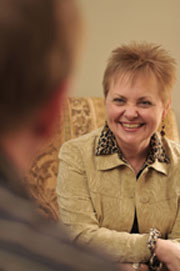 Gloria combines her life experience as a mother and wife with her knowledge of family systems to offer a unique blend of counseling theories and techniques to meet the needs of her clients. Gloria and her husband of 44 years Phill have been involved in marriage enrichment and were trained by David and Vera Mace, founders of the Association of Couples for Marriage Enrichment (now Better Marriages). In addition the Martin’s are trained in Couple Communication Program®. Gloria is a certified leader of Prepare and Enrich. The Martin’s have two adult daughters and one grandson.